Northwest Sampler Guild "Charlotte Clayton"
Must Stash Perfect Sock "Pippi"
With Thy Needle & Thread "Sampler Hill"
The Scarlet Letter "Dorothy Walpole"
Plum Street Antiques "1837 Crown Sampler"
I just discovered your amazing blog via 'Samplers and Santas' and i'm blown away by your fabulous stitching. 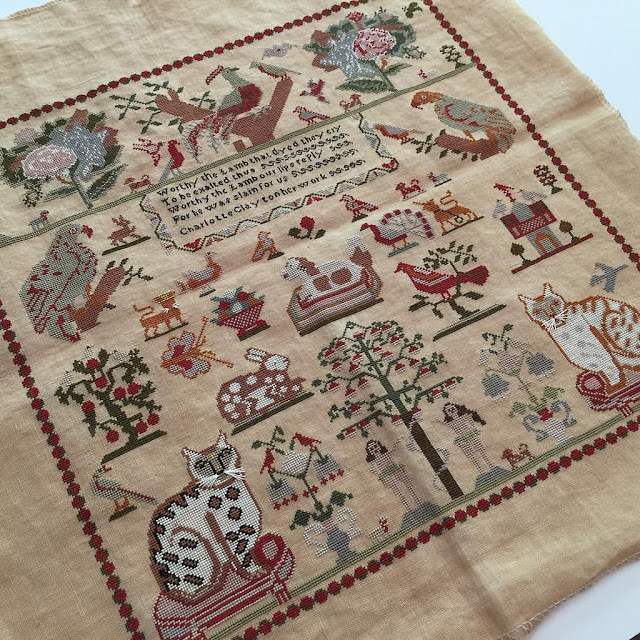 I love samplers too and it is so good to see the different colours of linen and threads you have used. Here in the UK I don't have a LNS and all supplies have to be by mail order so your blog and videos are a real treat! Thank you! 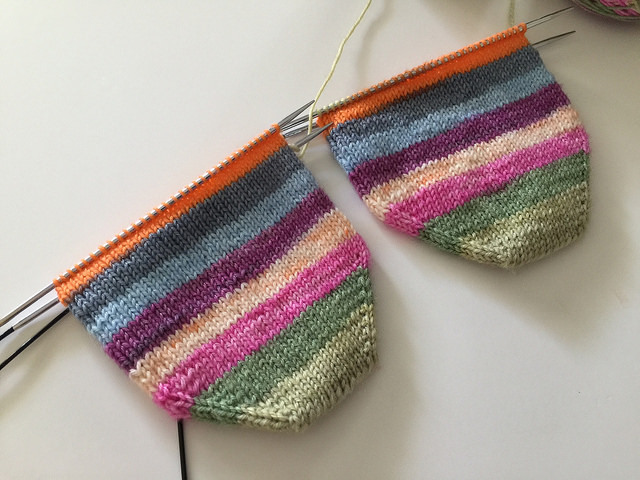 Hi Nicole, I really enjoyed watching you speaking about your Samplers and your black, white and pink chal : your finishes are absolutely gorgeous : many, many congratulations to you on such gorgeous works. 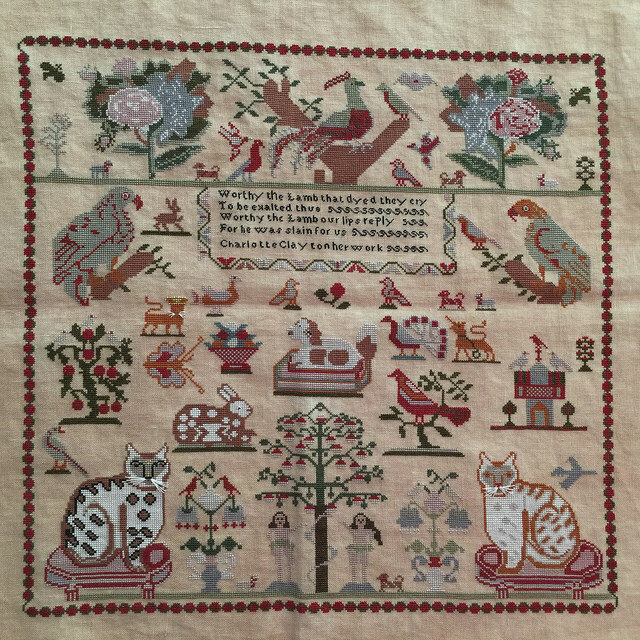 Isabelle fox is a nice project too but I must admt that I love your crown sampler from Plum street samplers. Please, could you tell me where it is possible to purchase lakeside Linen cuts ? Thank you for sharing with us your projects. Thanks Isa! You can get Lakeside Linens at 123stitch.com. 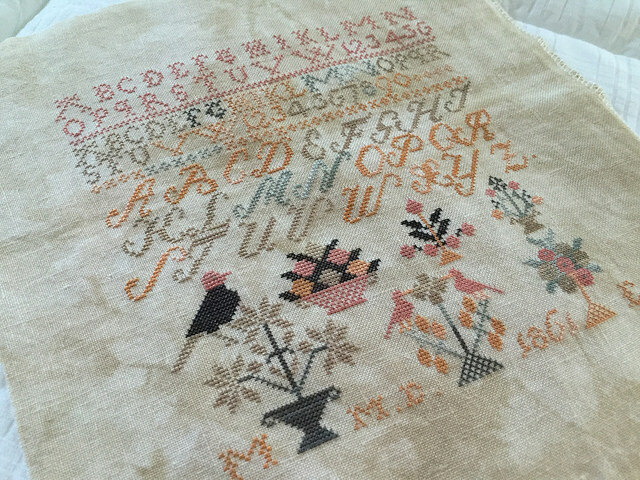 You are working on some beautiful Samplers! Congratulations on your fabulous finishes! I love seeing you chat on your blog! I wanted to tell you on one of your last episodes, you showed some beautiful yarns. I think we like the same colors because I LOVED the colorways of everything you had chosen. Love love love all your WIPs..can't wait to see the rest of them. Are you stitching with my sister when you are in Florida?? Enjoy your time with your family! Yeah, maybe one day I'll record myself stitching (or have one of the kids do it).